Incredible. If this reflection were to be one word, it would definitely be ‘incredible’. The highlight of the Prisons trail for me was probably the meeting with Nick, the prison warden. It was very interesting to learn about how the prison operated. 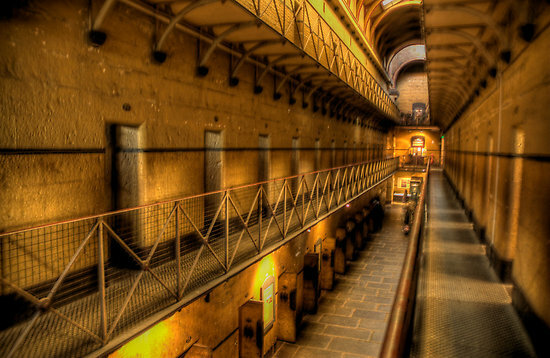 It also allowed us to contrast prisons of the 1800-1900’s to the modern ones, and the difference was huge. Visiting the Old Melbourne Gaol really gave me a deeper understanding of previous prisons, and while I was looking around I took the time to feel the mattress and blankets. Layered atop of one another it would be a third as thick as my own mattress. Had I been living in those conditions, with only an hour outside the claustrophobic cell a day, only to be given a ‘silence mask’ making it unable for me to see any other prisoner. The mere idea of this atmosphere makes me uncomfortable. Then I compared the two. Then: a mattress, a blanket, a chair, a table, a tap and a bucket. Only to add the minuscule concrete room. Now? An actual bed, a shelf, a shower, a toilet, a table, a chair and a decent room. Despite the difference sounding minimal in words, it really isn’t. In my opinion I appreciate the humanity of current prisons, although I can acknowledge hey had the same goals- rehabilitation. Both now and then rehabilitation was aimed for, although only when you were ‘behaving’, in terms of the old prison. Overall, after learning about how prisons and prisoner treatment has changed over the years, I think my understanding of prisons and how they work has been immensely deepened.